In January of 1907, the Montreal Wanderers and the Kenora Thistles battled for Stanley Cup supremacy. Aided by future Hockey Hall-of-Famers Tom Hooper, Tommy Phillips and Art Ross, the Thistles came away with 42 and 86 goals for a combined score of 128 to win a two-game total goals series. A "ringer", Ross was a member of the Brandon Wheat Kings and was borrowed by Kenora for just the challenge games. 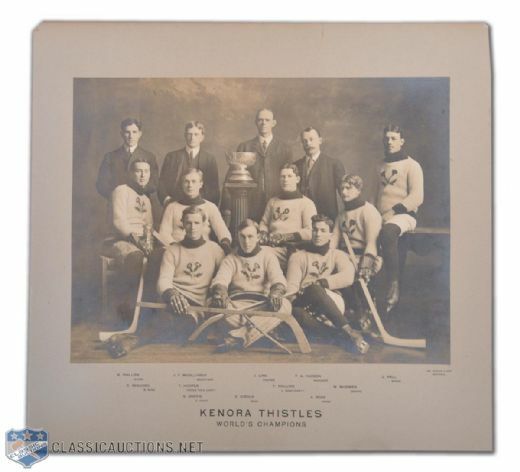 This ancient presentation-sized cabinet photograph depicts that winning Kenora squad and included are the images of Art Ross, Hooper, Phillips along with Eddie Giroux, Joe Hall, William McGimsie and Si Griffs. Preserved in near excellent condition on the original printed matte and measuring 15"x16" in size. A note on the verso, attesting to the provenance, reads "Jan, 1907, photo from family of Russell Phillips". Auction closed on Tuesday, November 16, 2010.